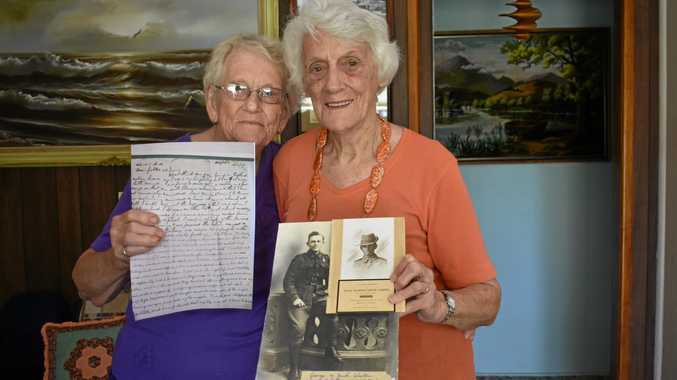 A LETTER from 1917 brought two women, whose stories had been intertwined for more than 100 years, together last week. Meeting for the first time, Margaret Buchanan travelled with a letter to Esther Skirman's home in Dalby. The letter, dating back to the World War I, was addressed to Mr and Mrs Larsen, Mrs Buchanan's grandparents, and signed by a Private George Walton. "It's from Private Walton in the First World War, to my grandmother, when her son was killed over in Belgium," Mrs Buchanan said. The letter describes the circumstances surrounding how 22-year old Harold Leslie Larson passed away. George Walton and Les Larson were extremely close friends and working as stretcher bearers across two separate squads on the fateful occasion. The letter reads: "My squad arrived safely but the squad Les was in had a shell burst somewhere almost under the stretcher, killing himself and patient instantaneously and wounding another bearer. I ran back... V. Sneyd and I carried his body behind a Pillbox for shelter... collected his effects... another shell... wounding three of us." The letter telling the story of her uncle's death floated around in Mrs Buchanan's family for a long time. "I often wondered if I'd ever meet anybody who was there," said Mrs Buchanan. "The letter has always been around. "It's only in the last little while that we've discovered the niece of this George Walton has met a few of my family members without realising." That's when Margaret decided to contact George Walton's niece, Esther Skirman. The two nieces of the respective soldiers met on November 29 at Mrs Skirman's home in a quiet street where they chatted and looking at photos. Mrs Buchanan said it felt strange to meeting after years of living only a couple of hours from each other. "It's only since I've been back that I've thought about how that man tried to rescue my uncle," she said. "Even though he died, he ended up with an official grave; he could have been one of the unnamed Australian soldiers who were just buried. "We're nieces of the two men and that's over 101 years ago. "And different members of my family had known Esther and other members of that family but didn't know the connection."